Griffin is dedicated to providing its drivers with the things necessary to support a great company experience and rewarding career. 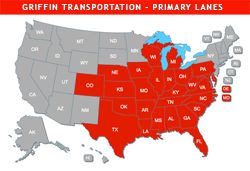 From comfortable, safe equipment to excellent compensation and benefits, Griffin will go the extra mile to ensure its drivers are treated as valued employees and important partners in the delivery of transportation services. Please complete the information below to receive more information about becoming a Griffin driver, including an Employment Application.